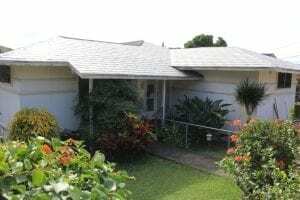 With Hawaii’s family-centered culture and high cost of living, it’s likely you know someone who resides in a multigenerational home. 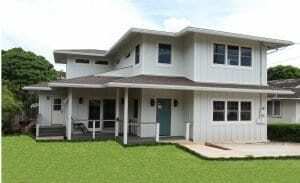 These residences make up for more than 11% of Hawaii homes, typically providing shelter for grandparents, adult children and grandchildren. Many of these families inherited their property from their family elders. Christin Sumida, a married mother and public school teacher, lives in a multigenerational home designed and built by Graham Builders. When her grandmother passed away, Sumida and her parents bought the property from Sumida’s mother’s siblings. The home after it was rebuilt by Graham Builders. Bruce Miyoda and his wife Linda also made the decision to replace a 60-year old home on family property and replace it with a new residence. The couple had been searching for the right home since moving to Hawaii. “My aunt was looking to rebuild or renovate a house that was passed on to her from her father,” says Miyoda. “She had gone to one of Graham Builders’ seminars and liked what she heard. She asked if we were interested in helping her as she knew we had been looking at houses. “My aunt felt very comfortable with everyone at Graham Builders. We didn’t know anything about building a house. It was very comforting to have one place to go to address all phases of the build. We wanted to incorporate things that would not only provide for the present, but for the future as well. “Both my wife and I had just experienced life changes with our parents and the accessibility needs that arise that you don’t normally think of. It was fresh in our minds as we started the design of the house, not only in accommodating my aunt and uncle if that situation arises, but also in having a space to age in ourselves. Graham Builders has helped hundreds of families to design functional, beautiful new homes and large renovations since 1990. The company has dedicated much of its efforts to helping families collaborate so they can complete their project and live comfortably under one roof. To design and build multigenerational homes properly, several Graham Builders employees have been certified by the National Association of Home Builders as aging-in-place specialists. 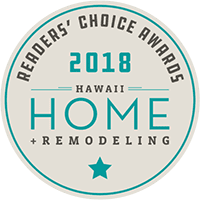 Homeowners interested in learning more about the ins-and-outs of home construction and multigenerational home design can attend Graham Builders’ upcoming “Building Your Home for Life” seminar on Saturday, March 2 from 9 to 11 a.m. at the Honolulu Country Club. Seminars are free and reservations are required. To register, visit www.grahambuilders.com or call 593-2808.